Over the years since the September 11th attacks, there has been an abundance of rumors regarding Osama Bin Laden's physical condition, and regarding the actual administration of the 'Qaedat Al Jihad' organization by Ayman Al Zawahiri. Due to the the overwhelming surplus of rumors and half-truths surrounding it, it is impossible to provide conclusive and definitive proof of the current state of the organization's high command This study examines the possible transfer of leadership within the 'Qaedat Al Jihad' organization and the question whether a change in tendency can be expected in the organization's future activities. In this study some 80 audio and video recordings have been examined showing the two senior leaders of the organization. Collection was carried out from public sources, mostly from the tapes themselves and partially from tape wording translated into English. The tapes were analyzed using psycho-strategic techniques. The personalities of the senior leaders, the forces affecting them and their perceptions were examined, and the future of the organization post-Osama Bin Laden was discussed. `Psycho-strategy is the branch of psychology concerned with analyzing profiles of leaders and their leadership. Its ultimate aim is to derive from the analysis of the profiles strategies suitable to the subjects of analysis. Strategy is determined by the analyzing entity with respect to the analyzed entity (the opponent). Unlike the separation of a research department from the strategic operations department, which is common in conventional military and security units, in psycho-strategy analysis there is no such separation between the analyzing unit and the unit drawing conclusions and making strategic recommendations. • Analyzing contents of the leader's public statements. • Analyzing micro-analytical and global behavior of the leader during interaction with various entities (from video tapes). • Profile analysis of the leader's activity during a determined time period according to reports such as: visits abroad, diplomatic meetings and active reactions to foreign and domestic challenges. • Structural analysis of the leadership, including understanding the formal roles of all administrative units. • Functional analysis of the relations between structural units of the governing body and analyzing quality of the leader's relations with close and distant government circles around him: his family and other entities whom he regards supporters and opponents in domestic and foreign relations. a) Analysis combining structural and functional components of the senior leadership of the 'Qaedat Al Jihad' organization, i.e., the leader and his deputy. In this analysis we examine leadership methods, the "intentions" and "enemies" of the leaders, the organization's structure, and discuss the the future of the organization post-Osama Bin Laden. b) Analysis of the contents of public statements made in audio and video recordings of 'Qaedat Al Jihad' leaders Osama Bin Laden and Ayman Al Zawahiri. This analysis includes examining the recordings with respect to the player(s) to whom the recording is directed (partial content analysis). During the 1980's Afghanistan attracted many volunteers from various Muslim and Arab countries, who came to assist the Afghani Mujahideen in their struggle against the pro-Soviet government in Kabul and the occupying Soviet forces. One of the prominent products of the Afghani Jihad is Osama Bin Laden. Following the Soviet invasion of Afghanistan and the call of the Mujahideen, Osama Bin Laden left Saudi Arabia, and together with a group of supporters and heavy engineering equipment arrived in Pakistan where he joined the struggle of the Afghani Mujahideen. At first, Osama Bin Laden was involved in establishing a recruitment system for Jihad volunteers: he financed recruitment and transportation to Pakistan, where he established a training camp where volunteers were trained to fight the Soviets. During this period, strong working ties were formed between Bin Laden and the Palestinian Sheikh Abdallah Azam, who was one of the spiritual leaders of the Jihad in Afghanistan. During the beginning of the 1980's the two established the "Services Office", one of the Islamic non-government welfare organizations handling recruitment, acclimatization and deployment of thousands of Islamic volunteers to Mujahideen camps in Pakistan and Afghanistan. After the 1989 victory in Afghanistan, leadership struggles between the various Mujahideen factions became evident. During this period, disagreements between Azam and Bin Laden also developed, sparked, inter alia, by Bin Laden's siding with the "Islamic Party" lead by Hekmatiar, while Azam tried to impose peacea between the Mujahideen faction and the Jama'a Alislamiya faction under the leadership of Rabani and Masuod. Azam even issued a Fatwa forbidding Muslim troops from taking sides in the power struggle over control in Afghanistan and generally opposed internal struggles between Muslims and against non-religious Islamic regimes for preventing conflict within the Muslim community. Due to these disagreements, Bin Laden disengaged from Azam and began independent operations. Azam's views also lead to disagreement with Ayman Al Zawahiri, another future leader of 'Qaedat Al Jihad'. While Azam believed that after the victory of Jihad in Afghanistan, focus should be shifted to Palestine, Zawahiri, head of the Egyptian Islamic Jihad faction that he belonged to, argued that Jihad should continue its struggle against corrupt, non-religious regimes in Muslim countries, such as the Egyptian government. The 'Al Qaeda' organization ("the base" in Arabic) was established in 1988 out of the "Services Office". Following the war in Afghanistan its operations were carried out mainly from Sudan and Afghanistan through a worldwide network of offices. The organization provided assistance to various terrorist groups and acted to radicalize additional Islamic movements. Following the mysterious murder of Azam in November 1989, Bin Laden became the sole ideological and actual leader of the organization. At the same time, a strong relationship developed between Bin Laden and the leader of the Egyptian Islamic Jihad – Ayman Al Zawahiri, whose organization also took part in the Afghan Jihad. With the end of the war in 1990, the new government in Kabul wanted to get rid of the Afghani Arabs and Zawahiri moved to Sudan, as Bin Laden had done. Towards late 1994 and in early 1995, Zawahiri, under the instruction of Bin Laden, tried to coordinate the activities of a number of Islamic organizationsb against the United States in order to break its hegemony in the Middle East. At the final meeting which took place in 1995, Zawahiri dictated the following steps for the struggle: a) Increasing activities of the Islamic networks in London and New York (while focusing mainly on Brooklyn); b) Increasing activities of the Islamic networks in the Balkan; and c) Providing assistance to the Muslim struggle in Somalia and Ethiopia. At that meeting it was also decided to establish a body to promote cooperation between the armed Muslim movements. From this year onward, Zawahiri subjugated his policy of terror attacks to Bin Laden's operational strategy, whereby the focus of terrorist activities was to shift from attacking Egyptian targets (as per Zawahiri's perspective) to attacking U.S. targets. It should be noted that since 1995 the Egyptian Islamic Jihad organization was a partner in 'Al Qaeda suicide bombings (in spite of the fact that since 1993 Zawahiri's organization avoided carrying out suicide attacks on Egyptian soil in order – or so it seems - to prevent harming innocent Egyptian citizens). In 1996, following the rise of the popular Taliban regime and after the American bombings of 'Al Qaeda' bases in Sudan, Bin Laden and Zawahiri reestablished their organization in Afghanistan. The two leaders began to weave a doctrine whereby the United States is the archenemy of Muslims, and its support of the regimes in Saudi Arabia and Egypt is the reason for the foiled attempts to topple them. In June 1996 Bin Laden published the "Declaration of War" Fatwahs in which he presented his perception maintaining that the entire world and the Middle East in particular is a theater in which a battle is raging between the three major religions of the world, which is embodied in the American presence in the area and by Israel. Toward the end of 1997, Bin Laden declared war on the Americans anywhere in the world. On February 23rd, 1998, Bin Laden published another Fatwa, in which he called for the establishment of an 'Islamic Front for Jihad against Jews and Crusaders'. In this declaration, Bin Laden stated (despite the fact of him not being a formulator of religious law) that every Muslim is obligated to kill Americans, civilians or military personnel, plunder their property and free the holy Mosque in Mecca and the Al Aksa Mosque from occupation. The signatories of this declaration were Bin Laden, Zawahiri, Ahmed Rifayi Tah, Fazlul Rahman and Sheikh Mir Hamza, who gave the Fatwa his approval as a religious precept. The declaration constituted the incorporation of an Islamic coalition uniting Islamic organizations from various countries against a common enemy. This union brought together the Islamic Jihad and the Jama'a Alislamiya of Egypt for the first time since a rift separated them in 1983, and rekindled the partners' recognition of the status of the man who initiated the Fatwa – Bin Laden. In June 2001 the 'Al Qaeda' organization, lead by Bin Laden, and the Egyptian Islamic Jihad organization, under Zawahiri, joined forces into one organization under the name of 'Qaedat Al Jihad' (which remained part of the Islamic Front – E.P.)c. This union expresses the profound relationship and cooperation between the two leaders. Zawahiri is considered the intellectual force behind Bin Laden, and the Egyptian lawyer Munchar Al Ziut commented: "Ayman is to Bin Laden what the brain is to the body." The treaty and friendship between the two also influenced their method of thought. At the beginning of their relationship both agreed that the Egyptian Islamic Jihad needs to reclaim its identity as an Egyptian organization, while the 'Al Qaeda' organization needs to be a player on the international stage as a multi-national organization. Over the years, Zawahiri persuaded Bin Laden that resources must be diverted to Jihad against heretic and demoralizing leaders of the Muslim world (in particular against Saudi Arabia and Egypt), and that driving out the American forces needs to be the primary target in the struggle against heresy. Bin Laden persuaded Zawahiri to cease military activities within Egypt and focus the struggle on the United States and Israel. This constituted a change in Zawahiri's priorities and ideology, moving away from the struggle against the near and immediate enemy in favor of a struggle against a distant enemy. The 'Al Qaeda' leadership was formed on the legacy that took shape during the Afghanistan war, according to the traditional Islamic format of leader and advisory council ("shura"). Decisions of the supreme leader made with the advice of religious advisors guide the organization's way. After Azam’s death, Bin Laden became the supreme and undisputed leader of 'Al Qaeda', but still, like during the ’Services Office' era, when Bin Laden was Azam’s right hand, the 'Al Qaeda' leadership was based on the support of a dominant deputy with either operational or spiritual talents. This deputy supported, assisted and shared the burden of decision-making and responsibility for the organization's policy. This decentralized method of leadership was apparently learned from Azam and influenced by Bin Laden's personality and from his manner of strengthening those around him. Bin Laden's first deputy was Mohammad Aataf who served as the first military commander of 'Al Qaeda' until his death during the American bombing of Afghanistan in November 2001. After his death, Dr. Ayman Al Zawahiri inherited his position as Bin Laden's deputy. Evidence from members of 'Al Qaeda' who have fallen captive over the years shows that, apart from being the most important figure of the "Afghanistan veterans" in general and of 'Al Qaeda' in particular, Bin Laden acts as the actual leader of the organization and that he is involved in strategic decisions and is meticulous about going into tactical details of specific terrorist operations. The report of the Congressional commission for investigation into the events of September 11th, describes Bin Laden's deep involvement in initiating and directing the attacks, in managing 'Al Qaeda's terror strategy and in micro-tactical decisions aliked. Although Bin Laden, who is not a formulator of religious law, did not negate the struggle of the radical movements against regimes in their own countries, contrary to most of the Islamic Jihad movements, Bin Laden took a different stand. Bin Laden supports the idea of the "Worldwide Jihad", which is intended to achieve the primary and first objective in the struggle of radical Islam – the eradication of the United States, perceived to be the snake’s head which constitutes, according to Bin Laden, the root of all evil in the world. In Bin Laden's opinion, the collapse of the United States will in any case mean the fall of all regimes which it supports including "heretic" Islamic regimes and Israel. In January 2002, the president of Pakistan, Pervez Musharraf, stated in an interview with CNN that in his opinion Bin Laden had probably died as a result of not receiving proper medical treatment for the kidney disease from which he suffers. He argued that Pakistan knew that Bin Laden took two dialysis machines with him to Afghanistan while one was suited for his own personal use. A senior official in the Bush administration replied to this statement by saying that there was no proof of Bin Laden's death, and argued that U.S. intelligence sources confirm that Bin Laden needed dialysis treatment every three days. Contrary to this, other U.S. officials deny these statements and repeat that there is no proof that Bin Laden ever suffered from kidney disease or was in need of dialysis treatment. In July 2002, German intelligence announced that Bin Laden was still alive. In addition, a senior editor of the Al Quds newspaper who interviewed Bin Laden prior to the September attacks, said that even though he had been injured during the American attack on his base in December, he was in good health. The editor continued to say that 'Al Qaeda' people had told him that Bin Laden would not be appearing in any additional video tapes, but only "give statements" until the organization launched another attack on the United States. At the end of 2004, the CIA intelligence estimated that Bin Laden's physical condition was serious but that his life was not in danger. According to their estimate, Bin Laden was suffering from an enlarged heart, chronic low blood pressure and kidney stones, but he did not need dialysis. In December 2006, Pakistani diplomats reported that Bin Laden's health was deteriorating, limiting his movements. It was also reported that Saudi intelligence had gathered reliable materials evidencing the seriousness of Bin Laden's condition and that it could be said with relative reliability that Bin Laden was dead. The same source added that if Bin Laden had died from typhus fever, this would reinforce previous reports of his inability to obtain medical treatment. These same sources went on to report on Bin Laden's past physical condition and said that after the September 11 attacks he was hospitalized in Kabul for kidney treatment. Similar reports stating that Bin Laden was suffering from a water-borne disease were received from Saudi intelligence sources and reported in Time Magazine. In a report by CNN, experts said this could possibly refer to typhus, dysentery or an e-coli infection. In spite of these reports, senior White House officials say that these reports are unreliable, and similar statements were made by the Saudi ambassador to Washington. Dr. Goldstein Farber has identified three main characteristics in Bin Laden's personality: a) feelings of humiliation; b) a need for freedom; and c) an overwhelming need for the love and support of those closest to him. These factors together with the effects of the Afghanistan Jihad, lead Bin Laden to feel that he and the Islamic 'nation' are victims of the Americans. Bin Laden grew to be a man who received love from people whom he empowered and to whom he gave freedom of action under his patronage, he does not see his role as that of a soldier but rather as one who empowers others. Bin Laden's manner of empowerment in 'Al Qaeda' is, inter alia, an expression of personality aspiring to achieve freedom he never had and of the traumatic separation from his parents which hindered the normal processes of growing up during is childhood, which brought out his need to grant freedom to others, even if they leave him and are at a distance. Relinquishing control and centralization were necessary in the Afghani reality in which he lived, and this has brought together his personality structure with the need to educate and empower others. The hopeless childhood competitions with the rest of his father's offspring and the loss of his parents' love caused him to stop competing with his successors. Like many others of his generation, Zawahiri's radical views were greatly affected by the defeat of Egypt in the Six Day War. Zawahiri was born in 1951 and joined the Muslim Brotherhood in Egypt during the 1960's. By the early 1970's he was one of the major leaders of the Egyptian Islamic Jihad. After the assassination of Sadat in 1981, like many other Muslim extremists in Egypt, Zawahiri was arrested and sentenced (to three years). In 1985 Zawahiri left Egypt for Pakistan where he worked as a doctor for four months, tending the Afghani Mujahideen injured during battle against the Soviets, in an effort of establishing a base for the Jihad movement in Egypt. In Afghanistan, Zawahiri found the perfect place to acquire operational, military, political and organizational experience for his Jihad movement. In Peshawar, Zawahiri separated his movement (the Islamic Jihad) from other competing movements such as the Muslim Brotherhood. Zawahiri criticized the Muslim Brotherhood for adopting the notion whereby the people are the supreme authority in the country (establishing a Muslim state from the ground up, in a quasi democratic fashion – E.P.). In 1988, the leaders of three other competing Egyptian Muslim organizations arrived to Peshawar to challenge Zawahiri. These leaders accused Zawahiri of corruption, of stealing money belonging to the Mujahideen and selling weapons supplied by Bin Laden in order to purchase gold. Following these accusations, several charity organizations removed their support of Zawahiri, which forced him to approach Iran for support. This in turn forced Saudi Arabia and other Gulf states to remove their support for Zawahiri. While the ideological battle between Zawahiri and his opponents continued, his connection with Bin Laden grew stronger. In 1992, the rivalry between the Egyptian Islamic Jihad and the groups opposing it reached its height with accusations of heresy and acts of murder. Zawahiri emerged stronger from this confrontation, mostly due to the support of Bin Laden.42 From 1993 onward Zawahiri stood at the head of main section of the Egyptian Islamic Jihad. Zawahiri dedicated his life to the Jihad and this cost him his family, his health and his freedom: in 1999 an Egyptian court sentenced him to death (in his absence), and in December 2001 his wife and some of his children were killed in the U.S. bombing raids over Afghanistan. If until this point there are more questions than answers regarding Bin Laden's physical condition and the transfer of leadership and change of strategy of the 'Qaedat Al Jihad' organization, a psycho-strategic analysis focusing on the leader and his deputy, will reveal many vital details that will help to better understand the situation. In order to reach these details, close to 80 audio and video recordings of Bin Laden and Zawahiri were analyzed using structural and functional techniques going back to the September 11th attacks until the present. The first video recording to be released after the September attackse documents the celebration of the formation of 'Qaedat Al Jihad' and from this recording we can assume that the intention of the organization's leadership was to attribute the attacks to the forming organization known as "Qaedat Al Jihad" and not to "Al Qaeda" in its previous incarnation. Between 2001 and 2007 more than 100 tapes were broadcast on behalf of the 'Qaedat Al Jihad' organization. Some of these were broadcast by Arabic networks such as Al Jazeera (Qatar) and Al Arabiya (United Arab Emirates), some were broadcast by Muslim internet sites, and a small number were broadcast exclusively by western communications networks. 2004 – The Lead Changes – From a quick look at the chart it may be argued that there is a slight change in leadership with regards to the number of tapes "in favor of" Zawahiri,l but even in this year we see the pattern of respect for "The Emir". Bin Laden's tape started the year off, the Zawahiri tapes almost always appeared after a 'Bin Laden tape' and a 'Bin Laden tape' was issued at the close of 2004m. We can only assume that the reason Bin Laden released less tapes is somehow connected with the plethora of (alleged) evidence of him being seriously ill.
We may assume that these tapes were intended to reinforce Zawahiri’s status and opinions in the event that Bin Laden’s health is critical. 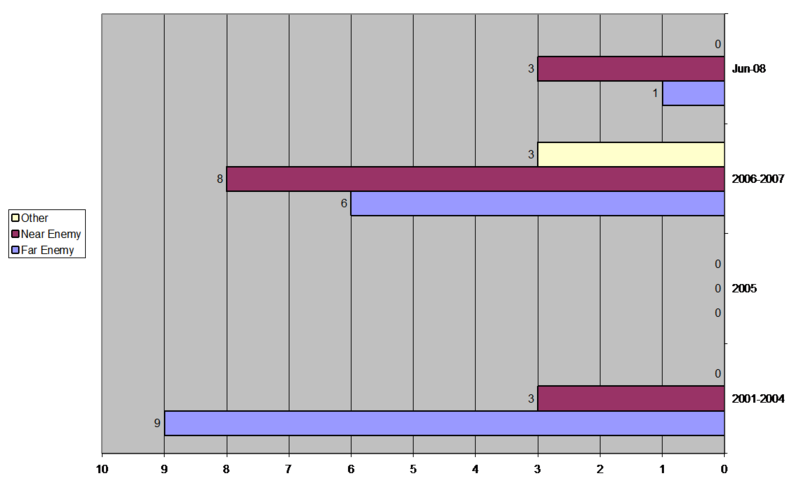 The tape broadcasts can be divided into three different periods. The first, between 2001 and 2003; the second during the year 2004; and the third between the years 2005-2007. 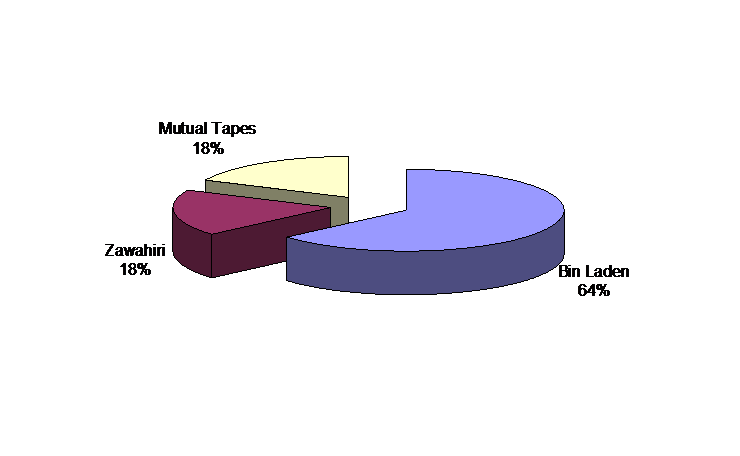 The pie charts below clearly show that, during the first period, Bin Laden tapes dominated whilst the number of “Zawahiri tapes” was equal to the number of joint tapes. 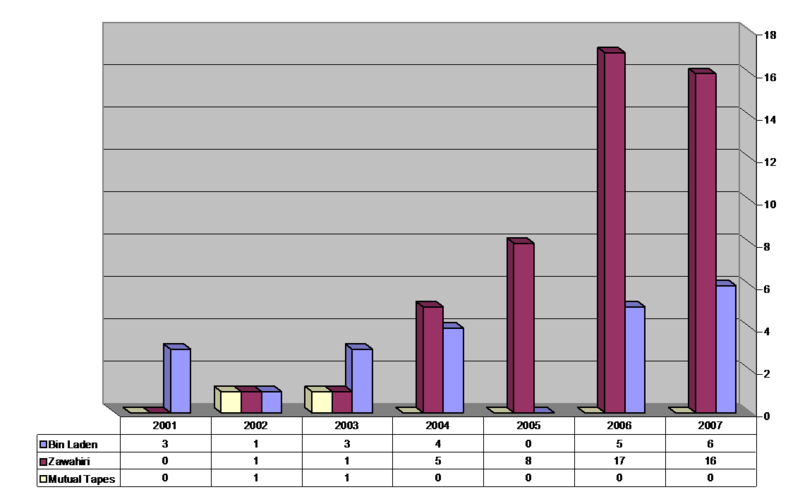 The second period (2004) marked a change in which for the first time the number of Zawahiri tapes was greater than that of Bin Laden tapes. During the third period, 'Zawahiri tapes' comprised almost 80% of the total number of tapes, a fact that together with the foregoing analysis of the tapes, evidences Zawahiri’s takeover in fact of the 'Qaedat Al Jihad' leadership in the wake of Bin Laden’s disappearance from the decision-making arena. It is this writer’s opinion that the pattern of tapes issued during 2001 to 2007 reinforces the evidence (in itself weak) of Bin Laden’s poor health. This pattern, together with Bin Laden’s character and the his manner of self-empowerment, shows us that Bin Laden felt it was time for him to take steps toward ensuring Zawahiri’s succession to leadership in the foreseeable future. 2008 – The Leadership Hand-Over Continues – A survey of the pattern of tapes broadcast in the first half of this year, reinforces the conclusion regarding the transfer of leadership taking place in the organization. Until the middle of 2008, 6 'Zawahiri tapes' and 4 'Bin Laden' tapes were broadcast. A 'Zawahiri tape' opened the year, and Zawahiri even serves as the official representative of the organization in providing answers to questions sent via e-mail with respect to the organization's future r, in an audio tape  one and a half hours long (and in writing). It is interesting to note that in this tape Zawahiri answered and said that following the pull out of American forces from Iraq, the Jihadic influence will move over to Israel. In addition relating directly for the first time to Bin Laden's physical condition, Zawahiri argued that Bin Laden is healthy and feels good. If we are indeed currently in the midst of a transfer of power from Bin Laden to Zawahiri, which will lead to the rise of Zawahiri as the primary (and official) decision maker and strategist, then another important question arises – if (and how) will the 'Qaedat Al Jihad' organization’s strategy change in the wake of Bin Laden’s leadership? In order to try and answer this question, the contents of Zawahiri’s and Bin Laden's tapes will be analyzed, each according to its major topic and the object to which they are referring when speaking of the 'distant enemy' (the west and the United States in particular) and the 'near enemy' (Arab countries, neighboring Muslim states and even Palestine). 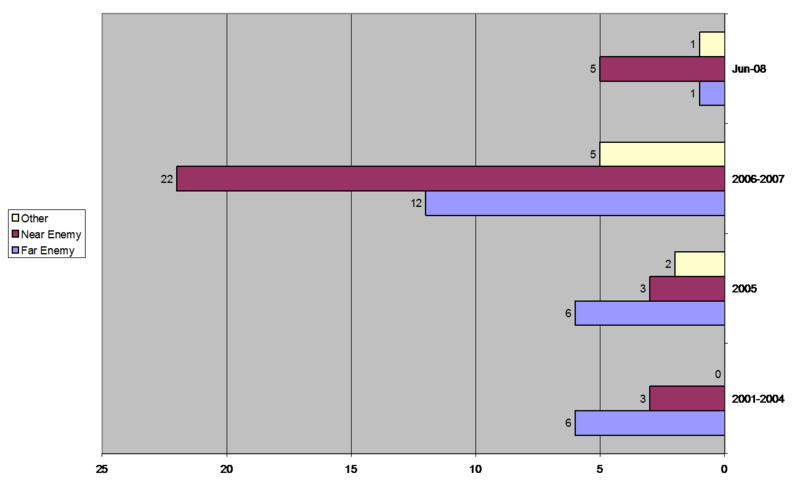 Analyzing Chart D, we can argue that during the period of Bin Laden’s active leadership, i.e. 2001 to 2004 (according to the prior tape analysis), most of Zawahiri’s announcements were concerned with the 'distant enemy', in line with Bin Laden’s own policy. In 2005, when no Bin Laden tapes were broadcast, the situation was surprisingly similar (apart from two tapes concerning other matters). This may be explained by Zawahiri’s great respect then (and still) for Bin Laden and his unwillingness to further his own aims before any official handover of power was made. During 2006 and 2007, we note a big difference between calls to the 'near enemy' and the 'distant enemy' on Zawahiri’s part. Until the middle of 2008, the pattern of referring to the 'near enemy' has strengthened and despite the difference in the number of tapes until now, the ratio of reference is even more extreme then in years past (5:1 in the first half of 2008 versus 1.8:1 in the years 2006-2007). Analyzing Chart E, we can see the pattern of objects referred to by Bin Laden. During the years 2001 to 2004 the announcements effect the announcements in Zawahiri’s tapes due to Bin Laden's hold of leadership (as previously mentioned). In the 'transition years' we identify a change in the announcement pattern in favor of the 'near enemy'. This pattern continues to gain strength in the first half of 2008. In this writer’s opinion, this fact provides evidence of Bin Laden’s waning ability to control the organization, and that most of the day-to-day activities are managed made by his deputy Zawahiri. The rift we see during 2006 and 2007, and the first half of 2008, shows that we are in the midst of an official leadership transition, from the Bin Laden period to the Zawahiri period, who has actually been the leader of the organization for some time now. This transition is accompanied by the promotion of Zawahiri’s ideology regarding the struggle with the 'near enemy' as opposed to Bin Laden’s ideology regarding the struggle with the 'distant enemy'; Bin Laden has granted some kind of approval of these steps as appears in the tapes from this period. Endorsement of this assessment comes from: a) Peter Bergen’s assessment that Zawahiri’s organization had taken over the Al Qaeda organization; b) Yoram Schwitzer’s assessment of a possible internal struggle within 'Qaedat Al Jihad' between the Egyptians and the Saudis, which reflects competition for leadership over the organization (the Egyptian Islamic Jihad and Al Qaeda, respectively – E.P. ); c) the fact that the threats and attacks from 'Qaedat Al Jihad' in the territory of the near enemy have grown significantly during the past few years; and d) Dr. Goldstein Farber’s assessment that Zawahiri’s aim is to make his personal mark through a new policy and training area that will outflank the allies’ attacks in southeast Asia. According to Dr. Goldstein Farber, Zawahiri is calling for volunteers to come to Darfur and it is not impossible that he will also try to act in the Sinai area because of his fondness for the Middle East and his mention of the Israeli-Palestinian conflict in various tapes issued during recent years. The pattern of recordings from 2001 to 2008 together with Bin Laden’s character, go to show that the 'Qaedat Al Jihad' organization is currently in the middle of a transition of leadership. From the patterns in the recordings, we can conclude certain facts regarding Bin Laden’s physical condition, which lead to a weakened ability to actively lead to steps taken enabling transition of leadership officially over to his deputy, Zawahiri, who has, in actual fact, been the organization’s leader for some time now. This official leadership changeover, is accompanied by the promotion of Zawahiri’s ideology regarding the struggle against the 'near enemy' as against Bin Laden’s ideology regarding the struggle against the 'distant enemy' and by some sort of consent on behalf of Bin Laden to such measures appearing in tapes from the past two years (2006-2007). If Zawahiri has in fact inherited the organization, it may be assumed that most of the organization's activities are directed (as is happening today) against the near enemy: a) the fighting in Iraq and Afghanistan will continue more intensely; b) the Jihad will extend into Muslim north Africa; c) the Jihad will actually be implemented against states where heretic Arab regimes exist (mainly Egypt, Saudi Arabia and the Persian Gulf Principalities); d) the Jihad will also reach the Israel-Palestine-Lebanon arena. Although this analysis shows that most of the organization’s activities will in the short term focus on the 'near enemy', nevertheless after the establishment and regrouping phase, we cannot rule out additional activities against the 'distant enemy' on its soil whether carried out by the mother organization or its derivatives. The author of this paper feels that, if the United States withdraws from Iraq (and even from Afghanistan) an “Iraq veterans” phenomenon will increase (in similar fashion to the “Afghanistan veterans”) and this will allow the organization “to heal”, to recover its strength once more and move from the defensive to the offensive by deploying terror cells to the 'near enemy' states (and possibly also to 'distant enemy' states). This situation will cause serious damage to American interests in the Middle East and throw the whole area into unprecedented chaos. After Mohammad Aataf was killed and the severe damage caused to the Taliban and 'Qaedat Al Jihad' during the American attack on Afghanistan in November 2001, orders were received from the organization’s command to withdraw from Kabul toward Kandahar. After a while, the organization's leadership made the decision to seek asylum in Iran and go into hiding on the border with Pakistan. Part of the initial deal between the organization’s 'soldiers' and the Revolutionary Forces was made by the Afghani leader in exile, Hekmatiar.v After the arrival of members of the organization, some of them were debriefed by Iranian intelligence and they were offered intelligence work for Iran, including receiving a monthly salary, an Iranian passport and military training with the Hezbollah in Lebanon. Some 350 combat troops and 18 officers from the organization found asylum in Iran and were housed in comfort without coercion in Al Kuds camps belonging to the Revolutionary Forces in Namak-Abrudw and Lavizanx. Amongst the main leadership stayingy in Iran were several members of the “Shura Council” of the organization, including: the head of recruitment – Abu Zubidaz; the ex-speaker of the organization – Abu Leith Al Libiaa; Bin Laden’s sons – Saadbb and Hamza, considered to be his spiritual and business successors; and Asif Al A’adel, seen as number three in the organization (immediately after Zawahiri). The Iranian connection threw a considerable shadow over 'Qaedat Al Jihad' because of the inter-ethnic unease.cc Currently it seems that the cooperation will continue only as long as the organization benefits from it. The connection intended to provide the organization with economic and organizational “space” and allow it to obtain technology which may be used for mass destruction. If such extreme scenario actually takes place and Asif Al A’adel and his Iranian partners inherit the leadership of 'Qaedat Al Jihad', we could assume that the organizationee would split into its various divisions, between the Sunni supporters and the Shiite supporters. It is also possible that there be a split in the organization between 'Al Qaeda' and the 'Egyptian Islamic Jihad' under Zawahiri who will not agree to be “number two” under “number three”. • In light of the leadership transition under discussion, the major part of our intelligence and operational efforts should be directed toward Ayman Al Zawahiri and the leadership circle supporting him. • If it is possible to arrest Zawahiri and put him on trial/attack him, then Al A’adal should be treated in a similar fashion. Although it is possible to assume that the organization will split into its component parts following the departure of Bin Laden and Zawahiri, a move of the stable leadership of the organization into Iranian hands would be worse than continuing with Zawahiri as leader. • We need to invest most of our efforts in creating conflict between 'Qaedat Al Jihad' and Iran (either through a religious quarrel or some other means). This type of conflict would harm not only the organization but also Iranian interests. • The international presence (the Americans in particular) in Iraq and Afghanistan must continue. Without such presence (no matter how painful) the organization could cross the contact lines and move from the defensive to the offensive and attack many U.S. and western interests in the Middle East, the Persian Gulf and even in the U.S. and Europe. 2. S. Shai, The Never Ending Jihad…: Mujahideen, Taliban and Bin Laden, International Center for Policy Against Terror, published by the Interdisciplinary Center Herzeliya (2002), p. 117 (hereinafter: Shai 2002). 15. S. Shai, The Shaheeds: Islam and Suicide Attacks, published by the Interdisciplinary Center Herzeliya (2003), p. 119 (hereinafter: Shai 2003).